Excess sugar consumption has been linked with numerous health problems such as obesity, tooth decay, diabetes, cardiovascular disease, Alzheimer's disease, and hyperactivity. While many of these links are inconclusive, with the average person consuming 23 kg of sugar each year, there is little doubt it affects our health on a number of levels. Even people who are happy to consume sugar are increasingly looking for alternatives as a way to moderate their sugar intake. Agave is one popular sugar substitute, made from the same Mexican succulent as tequila. However, while it's often marketed as a safe and natural alternative to sugar, agave contains roughly 90 percent fructose, the part of sugar people are generally trying to avoid. Fructose or fruit sugar is a simple monosaccharide found in many plants, with excess fructose consumption hypothesised to be a cause of insulin resistance and obesity among other things. Luckily, for people who want a sugar substitute with less fructose, there are other alternatives. Sugar from coconuts is sold in many health food stores and supermarkets, in the form of nectar, syrup, and sugar crystals. While it contains much less fructose than agave at somewhere between 38 and 48 percent, this only puts it slightly lower than conventional sugar products which are generally 50 percent fructose. Honey and maple syrup are two traditional sugar substitutes, both of which have a similar level of 40 percent fructose. If you really want to avoid fructose altogether, there are both synthetic and natural alternatives. In the United States, seven intense sweet sugar substitutes have been approved for use, all of which contain no fructose and most of which are synthetic: stevia, aspartame, sucralose, neotame, acesulfame potassium (Ace-K), saccharin, and advantame. Aspartame, first sold under the brand name NutraSweet, has become a controversial substance in recent years. While expert agencies in the United States and elsewhere have concluded that aspartame is safe for use, numerous health complaints linked to aspartame have circulated since the substance first appeared on the market in the 1980s. 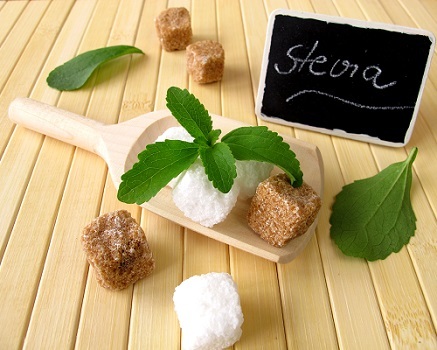 Stevia is of particular note as the only non-synthetic intense sweetener in the above group, extracted from the leaves of the plant species Stevia rebaudiana. Stevia is 300 times sweeter than sugar and contains no fructose whatsoever, making it highly valued as a natural sweetener. While Stevia has been freely available in most countries around the world for hundreds of years, the European Union only approved stevia additives recently in 2011. A similar situation exists in the United States, where Stevia was banned until the early 1990s. While not as strong as stevia, another natural sugar alternative with no fructose content is rice malt syrup, a product made from fermented cooked rice. Made from a blend of complex carbohydrates, maltose, and glucose, this natural sweetener is the sugar substitute of choice for many people around the world. Whether you're looking for a synthetic sweetener or a natural alternative, it's important to do your research and make sure the sugar substitute you choose isn't doing more harm than sugar itself.